An unlikely team of players have been brought together to play an exhibition basketball match. The players come from all walks of life, a wide range of ages, and include a zoologist, a mum-of-three, a school teacher, two young men whose brother is an Olympic medallist, and a former ambulance driver. 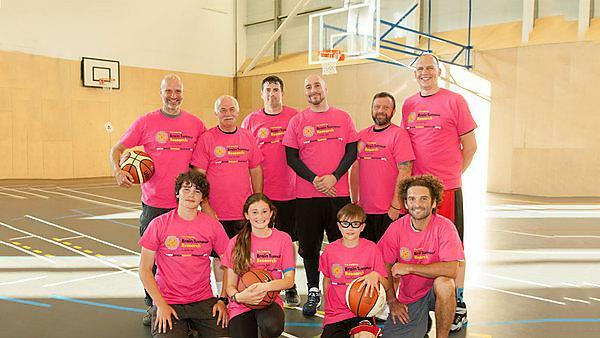 Many of the players have never tried their hand at basketball before, but all have one thing in common – each one has experienced the devastation caused by brain tumours. The Brain Tumour Research All Stars team has been brought together for an intensive training course, ahead of the Unity Through Basketball event which takes place on 3 September. Unity Through Basketball is a not-for-profit organisation founded by Plymouth local league basketball players Troy Woodhouse and Ben Byrne which uses the sport to raise money for charitable organisations. Team members include Benjamin Mee, Director of Dartmoor Zoo, who lost his wife Katherine to the disease and is an ambassador for the charity Brain Tumour Research which will benefit from funds raised by the event. Benjamin and Katherine’s children Ella, age 13, and Milo, age 15, will be the team’s youngest members. Also on the court will be Debra Daley, mother of Rio and London Olympic dive medallist Tom Daley, who lost her husband Robert to a brain tumour and her sons Will, age 20, and Ben, age 17. The Brain Tumour Research Basketball Challenge is dedicated to the memory of Caroline Johnson, who was working at the National Marine Aquarium and studying for her masters at Plymouth University, when she was diagnosed with a terminal brain tumour. Caroline defied the odds and was able to spend a few precious months at home with husband Marcus Cronin and their baby Florence before she died in October 2013 at the age of 32. Keen basketball player Marcus, of Commercial Road, Plymouth, will also be among those taking part in the challenge which will see a number of matches played at Plymouth School of Creative Arts ahead of a black tie dinner at the New Continental Hotel. Coach Troy Woodhouse, co-founder of Unity Through Basketball, is among the organisers of the event and is putting the players through their paces for the big day. “We are extremely grateful to everyone involved in organising this event and are looking forward to some great sportsmanship and lots of fun. It is a sad fact that brain tumours are indiscriminate and can affect anyone at any time. For more information about the challenge and to buy tickets for the after-party please contact troy@wearegammaray.co.uk. The money raised will support pioneering work which is taking place at a network of Brain Tumour Research Centres of Excellence including one at Plymouth University. The team there is led by Professor Oliver Hanemann, and is focusing on identifying and understanding the mechanism that makes a cell become cancerous. The scientists are exploring ways in which to halt or reverse that mechanism. An innovation will be testing new drugs in human primary cell cultures leading to innovative phase 0 trials. It is hoped that this will be followed by adaptive phase II/III trials with the potential for making drug therapies available to patients safely and more quickly. To make a donation go to https://www.justgiving.com/fundraising/Beyond-Basketball.